Looking for a LogMeIn Promo Code or Discount? - Splashtop Inc.
Save even more, up to 80% off LogMeIn prices, by choosing Splashtop instead. You can get the fastest, most secure, remote desktop access solution without paying a fortune. Splashtop’s remote access (Business Access), unattended remote support (Splashtop Remote Support), and on-demand attended remote support (SOS) solutions are reliable, award-winning products that offer you better deals than LogMeIn, even with a coupon code. Plus, Splashtop won’t raise your renewal prices annually like other remote access products, including LogMeIn. In case you haven’t heard, LogMeIn has raised the price of their remote access product by over 253% over the past five years. So why spend your time looking for a coupon code for minimal savings now when you’ll have to still pay more? Splashtop gives you the best remote access solutions at the best value to you. When comparing LogMeIn Pro to Splashtop Business Access, Splashtop costs less, runs faster, and also lets you access more computers (up to 10 per license). 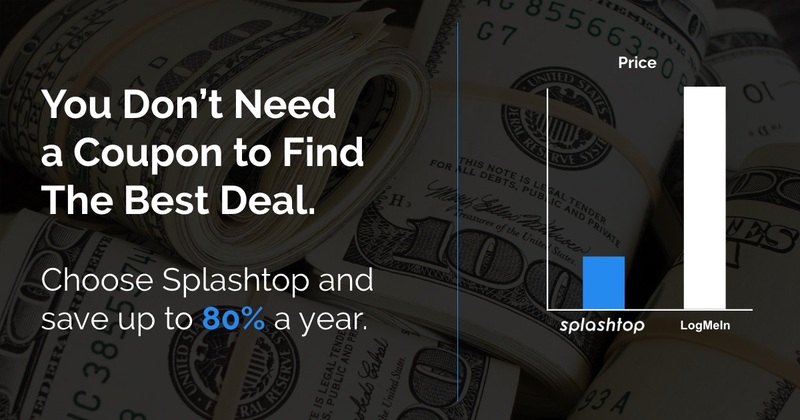 You can save up to $289 – $6,759 a year when you choose Splashtop Business Access over LogMeIn Pro. You can save up to 80% when you choose Splashtop Remote Support over LogMeIn Central. No coupon code can make up for that! Don’t let the price difference fool you though, Splashtop Remote Support has the same top features as LogMeIn Central. You can remote into any Mac or Windows computer at any time, from anywhere, on any device with Splashtop Remote Support. SOS is the best attended remote support solution on the market today, and it’s available to you at half the price of LogMeIn Rescue. Many former LogMeIn customers, frustrated by increasing renewal prices, have already switched to SOS which comes with all the top features you need to provide remote support on-demand. Remote into any device at a moment’s notice, without the end-user needing to download or install in applications. Headquartered in San Jose, California and founded in 2006, Splashtop has focused on providing the best remote desktop, remote support, and screen mirroring solutions. Splashtop remote access solutions are used by tens of thousands of businesses and more than 20 million users for more than 500 million sessions. Our prices are lower than our competitor’s because we spend less on marketing and rely on word-of-mouth through our customer’s positive reviews to help spread the word about our products.